For questions regarding an specific store’s hours of operation, please call the store directly. Telephone numbers for Marco Walk Plaza tenants can be found in our store directory page. Holiday hours may vary. Take I- 75 south toward Naples to exit 101. 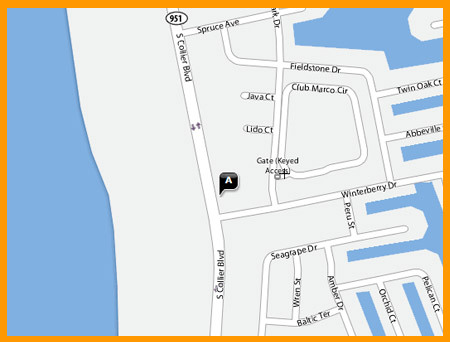 Turn right onto CR-951 S/Collier Blvd. to Marco Island. Drive 18 miles to Marco Walk Plaza located on the left, across from the Hilton. The estimated time from this airport is 1 hour, 2 minutes. Take FL-836 west to the Florida Turnpike south. Take exit on the left toward Homestead/Key West. This will merge on US-41 West. Enjoy the trip through the Everglades. Turn left onto CR-92. Turn left onto Collier Boulevard. Drive approximately 2 miles to Marco Walk Plaza located on the left, across from the Hilton. The estimated time from this airport is 2 hour, 3 minutes. Take I-595 west towards I-95/Florida's Turnpike. Take the I-75 north towards Naples to exit 101. Turn left onto CR-951 S/Collier Blvd. Drive approximately 18 miles to Marco Walk Plaza located on the left, across from the Hilton. The estimated time from this airport is 2 hour, 3 minutes.